The work is a unique site-specific design in which both the bridge function and topography of the site provide the design logic for the safety screens. 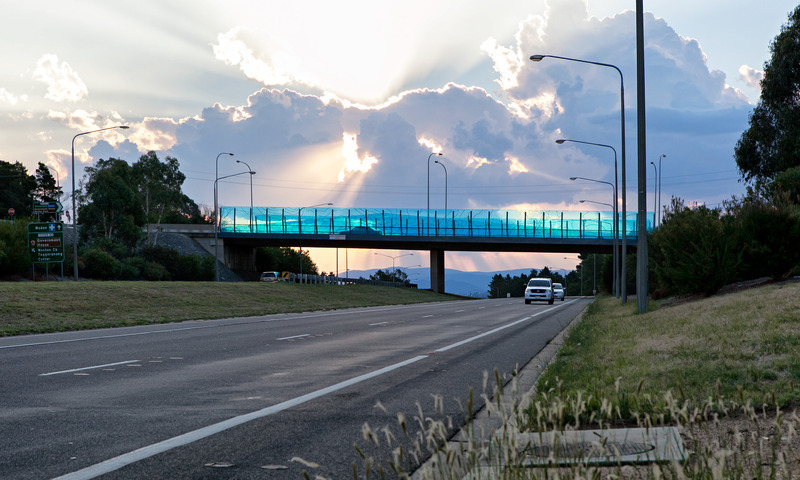 The screens are an undulating sequence of ‘folded’ translucent blue acrylic panels across which extends a tracery of etched topographic line-work drawn from the surrounding Canberra Valley landscape along the Adelaide Avenue access. If the two vertical screens were laid flat with their upper edges touching you would see reflected both the actual topography of the site and the bridge’s path as it traverses the landscape. It is in essence a self-referential loop of sorts, in which the design of the bridge screens mirrors the landscape on which they sit.